We got to a fairly small church. The red brick building is small and size, and in it's former life was, fittingly enough, a fairly conservative Mennonite church. Reemerging in the 80s as a non-denominational church filled will people from all walks of life, the hearts of the congregants are anything but small. Our church is probably not everyone's cup of tea. It is laid back in its liturgy but hard lines its theology. There is a bare bones service order, and usually, there is no communication between worship leader (usually Herb) and pastor about topic/theme/message for the following Sunday. When things line up just write - like Herb picked a song like "Healer," and Dennis planned to pray for some people who were struggling with sickness, you know, "Wow, that was the Holy Spirit." Yesterday, one such event happened. Because of Levi's comments on music shutting him out, I have been taking a big step back from tickling the ivories on worship team, and have only been playing 1-2 times a month. Herb decided to take a week off to be with Levi, and I would take the reigns as piano player and lead worshiper. As I prayerfully considered what songs to do (and analyzed which songs we haven't done for a while - thank you Planning Center), I knew I wanted to introduce a new song - Oceans by Hillsong. From the downbeat of the song during rehearsal, it was evident this was a God-ordained good pick. It resonated with members of the worship team, and we all felt like we wanted to keep singing all night. So, on Sunday morning when I heard the congreation singing loudly (not at all like it was a new song), I wasn't completely surprised. This is a good song. It's about a GOOD God. What I didn't know, because we have a laid back service, was that Tal Zentmeyer was there to perform a piece of spoken word after worship. Tal is from Tampa, but his parents ended up in Manheim at our church. Whenever he's in town, we have the pleasure of having something truly unique for our little red brick church during worship. Have you heard of spoken word? Think of poetry mixed with hip hop, but not quite like rap. Actually, you should just pop on over to Tal's website, Be Louder, and listen to a few pieces. They are moving to say the least. So Tal takes the stage, and says he had picked out a piece to perform that had some singing in it. He's really excited because he had not told the Pastor what the song was, and he had certainly not communicated to me. His piece, "This Is Good," has spoken word for the verses, and then a few times a singing chorus pops in that he invited us to sing along with. "I will call upon your name. Yep - as you probably guessed by now, it was the chorus of Oceans, the NEW song we had just sung in worship, two minutes prior. It was a pretty major Holy Spirit moment. God was guiding song selections - how could this be only a coincidence? Ah. Such a good moment. Such an amazing God. The last couple weeks have been pretty amazing and equally intense. We've been busy doing fun stuff and mentally I'm always thinking about the adoption, house projects, yard sales, and planning our summer. I've been marveling at how much difference the entire adoption process has been this time. So much faster, so much more contentment on my part. We are waiting on our official home study approval, which is exciting in itself, knowing that the future of our family is evolving and being molded and trusting that God has the perfect lite one picked out to be a little Suereth. I have nervous anticipation, but still overall feeling so content with where we are. God has clearly directed our path up until this point and I'm happy to keep following. I will say, though, making a "profile book," is much more annoying this time. Not sure why - the first time it was my favorite thing to do! My in-laws were in town at the beginning of June to celebrate a myriad if extended family events. They bunked up at our house - and can I just say, nothing swells my housewife heart like having my mother in law compliment my organization and cleanliness. She's pretty awesome. So, in addition to a gradation party, adoption agency picnic, and baby shower, everyone came to cheer me on at the Manheim Rock N Glow 5k. Running at night? Awesome. A personal record? Sweet. A race and memory shared with my brother and sister? Priceless. Our parents and my friend Sammy came to cheer us on and help watch kids. I'm feeling a little bad because the race didn't start till 9, so by the time we walked home (oh small town of a Manheim, I love you), Levi actually asked to go to bed.... And did. Who would have ever imagined the three Stoltzfus kids running? Not me!!! My mom denied it, but she was getting emotional about all of it. She reminded is how we all used to hate each other and back then she said ,"someday you'll travel hundreds if miles to see each other." How neat it is to be at that spot. But the most credit for traveling goes to my little sister, Wendi, who came from Astoria, NY to run with us. She also came home for 12 hours to be with me on my birthday just 12 days later. 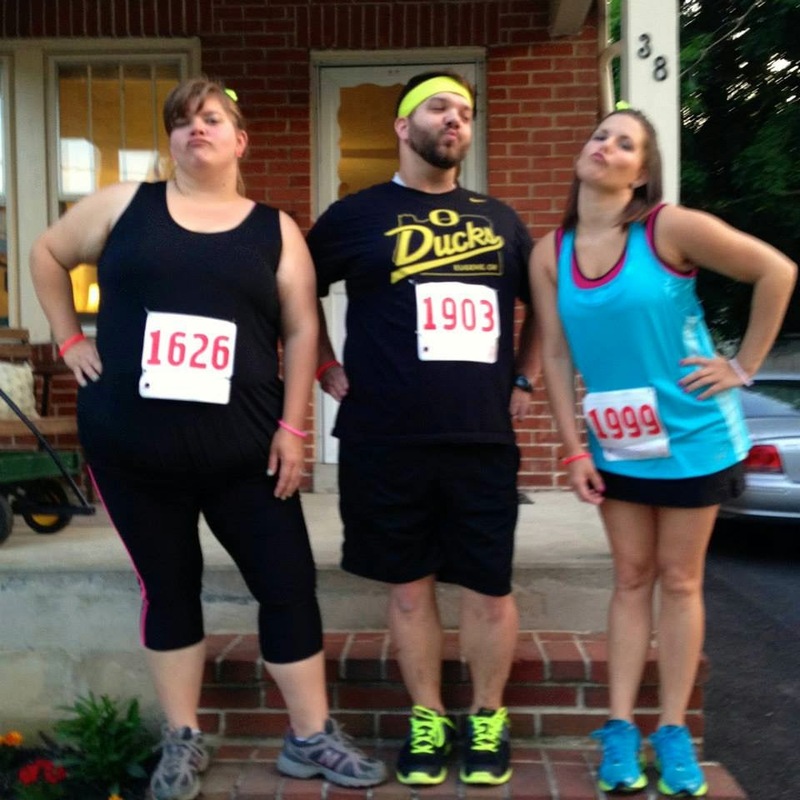 Doing the 5K with my brother and sister reaffirmed what I already know to be true.... Giving Levi a sibiling is the best thing I can gift him. That's certainly not the only reason for adopting again, but I'm sure excited about it.